Generally powered by a Perkins diesel, these were very popular vehicles. Supplied new to Pointers of Norwich, and used on cement work, sold on to Clifford Pye Ltd and sold on again to L. Fletcher and converted to tipper. Purchased by R. Lea of Edgmond, Shropshire from a farmer in 1998 and rebuilt. Location: CVRTC Classic Commercial Motor Show 2002, at Gaydon, Warwickshire. Photo taken by Bill Clowes. Perkins 6.354 engine, 5 speed gearbox, Eaton twin speed rear axle. Really smart looking truck. Added by Dmackay on 17 October 2009. Added by Don McGregor on 28 September 2010.
most of them had mixer bodies, but I think there were also a couple of tippers.You may be interested to know that Clifford Pye are still trading as a large farming group about 8 miles North of Norwich and run a modern fleet of artics .Great picture Bill. Added by Andy Wilson on 01 February 2011. 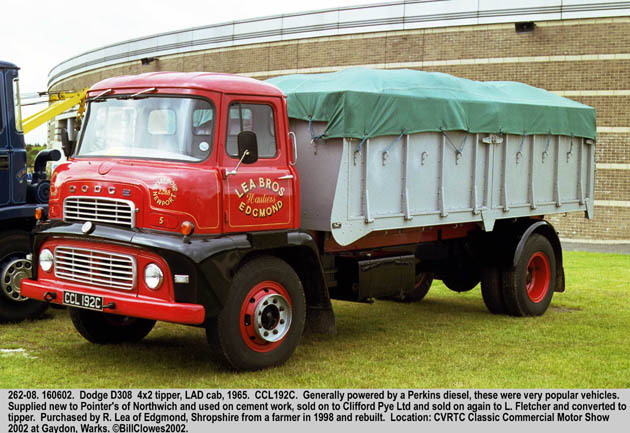 I drove one off these in 65-66 lovely wagon to drive I used to carry salt in it, the Dodge I had was a tipper with a eaton two speed axle. Added by Peter Drinkwater on 28 April 2012. When I moved to another firm they gave me one of these d308, it was a flt wagon and could it shift then they started to get these newer dodge with a tilt cab with a perkins in it, what a load of rubbish they were handbrake started to jam on even at the docks after about 10 minutes it would come of after you built your air up. Added by Peter Drinkwater on 29 April 2012. I had one of these with a 20ft body grossing out at 12t as my first truck (652 ARV), if I could have kept one truck she would have been it. Added by Gary Cobb on 05 June 2014. My 652 had a Perkins P6 in her as well, pulled like a train, she was followed by a K series unit with one of the first two V8 Cummins in her, she went well but because of having very few motorways back then she did a set of injectors in every 6 weeks. Dad sold her for a new 69 Leyland Badger ergomatic unit. Added by P Drinkwater on 20 February 2015. Added by Philip Jackson on 13 July 2016.